In a world where seemingly everyone has a device that they bring everywhere, how can you make this trend work for your business while keeping your IT infrastructure from being infiltrated by malicious entities? By instituting a conscientious and thorough Bring Your Own Device (BYOD) strategy, your company can make your staff’s devices work for your company. Most business owners would agree that their employees already bring their smartphones to work, and will continue to do so whether your company policy allows them to or not. In fact, according to a study by Microsoft, over 67% of employees at surveyed companies bring their devices to work, regardless of their company’s policy. Based on this statistic, it would seem as if a Bring Your Own Device strategy would be a no-brainer, but there are many other variables to consider. For instance, a major point of contention between network administrators and employees that take advantage of their mobile device’s dynamic computing capabilities is that many mobile device management strategies include an option to wipe-clean a device of a user that has left the company. While this is something that the user would have to agree to, most users would rather remove the company data voluntarily than have their personal device wiped clean. For reasons like this, BYOD is not a cut and dry matter, even for companies that have been doing it since before it was known as BYOD. In order to begin to design a BYOD policy that works for your company, you will have to determine the necessary elements you are trying to protect, the access employees have to those elements, and how to react when you need to enact the protocols of that policy. The first consideration you should have is whether or not the additional mobility would be of any benefit for your organization. The ability to reach beyond your network and still access all the work-related material can be an indispensable factor for the modern employee. People are busier than ever and often need to multitask just to get by. Facilitating work outside of the workplace has to be a consideration for any business owner looking to expand his or her business. Conversely, as a business owner you’ll also need to understand what threats the threats that are inherent by allowing foreign devices to access your network, as well as the issues that come with allowing your data, the lifeblood of your business, to be accessible on other networks. With sensitive data breaches costing companies thousands of dollars, can your company sustain itself if you were put in that unenviable position? At Blue Jean Networks, we’ve designed and implemented mobile device management solutions for companies that are searching for ways to improve their portability and use the advanced mobility to enhance production. Another variable you will have to consider is that of an Acceptable Use Policy. This policy governs what content is available to people on your network. This policy is created with the best interest of the organization in mind, implemented by the network administrator, and policed to the extent required by your organization. In this policy you are able to set forth what is off limits to the end users. The IT professionals at Blue Jean Networks can help you by providing all relevant information so that you can make informed decisions about what content to block and what content to make accessible to maximize your organization’s productivity while keeping your staff’s needs in mind. It’s a connected world we live in and limitations placed on your staff’s ability to receive information, could actually be a hindrance to your organization’s productivity. Specify which devices will be permitted on the network. Establish static and comprehensive security strategy. Define how foreign devices can access data on the network. Ensure staff knows who owns what on the mobile device. Make a decision on what kind of use to ban on foreign devices. 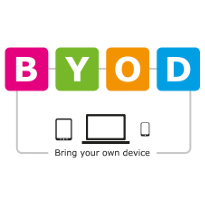 Combine your BYOD strategy with your acceptable use strategy. The consideration of these variables will go a long way toward concocting a BYOD policy that both fits your organization and ensures that the security of your data isn’t available to be compromised. At Blue Jean Networks we promote small and medium-sized business efficiency by disseminating expert IT services and support. For more information about our vast array of IT services including comprehensive mobile device management and IT consulting, call us today at 817-231-0222.